The No. 19 Ohio State Buckeyes powered their way to an 8-1 mark behind an 18-point effort by Keyshawn Woods to knock off the Illinois Fighting Illini, 77-67 at the United Center on Wednesday night. Here are my five things to take away from Chicago. After going scoreless against Minnesota on Dec. 2, Keyshawn Woods reasserted himself into the fold with a team-high 18 points on 6-of-10 from the field. The bad performance would be a thing of history as the first jump shot at the 11:48 mark helped set the tone for the rest of the game. Buckeyes coach Chris Holtmann noticed the ease Woods showed throughout the game and the first jumper made a big difference. “You have to have a level of poise and [Keyshawn] steadied us," Holtmann said. “We don't win the game without him making the reads and getting to the foul line." Kaleb Wesson provided instant offense in the post for the Buckeyes in the second half with a pair of makes to pull to within 40-38. Wesson’s play on both sides of the ball set the tone as Ohio State made 10 of its first 15 baskets as its lead grew to 61-53. Wesson hit the double-digit mark in scoring for the sixth straight game with 13 points, on 5-of-8 from the field to go along with seven rebounds. The Illini’s leading scorer lived up to the billing on offense with 18 points. However, foul trouble and lack of involvement from other players played a role with 10 assists and 14 turnovers. Things got worse as Frazier left the game with 1:19 left as Luther Muhammad fouled him hard and went back first onto the floor. Frazier returned moments later, but only to foul out with 35.5 left. Illinois coach Brad Underwood believed that his tailbone took the brunt of the fall and was glad to see him back in the game. "I saw the expression and had a horrible feeling in my stomach. It did give me a relief that Trent came back in moments later," Underwood said. Despite holding an eight-point lead in the first half, the Illini began to falter in the early stages of the second half with a combination of foul trouble and lack of creativity. Starter Giorgi Bezhanishvili fouled out at the 8:18 mark and to add insult to injury, Frazier, Kipper Nichols and Da’Monte Williams played with at least four fouls for significant portions of the second half. 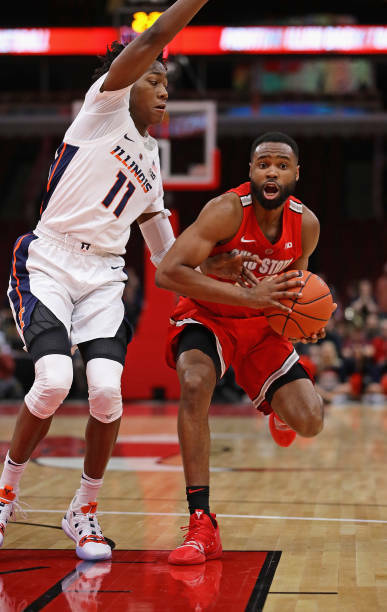 The predicament made led to Illinois errors as Ohio State took advantage and opened its lead to as many as 13 points. Illinois shot 27.3 percent (9-of-33) in the second half, highlighted by 13 missed layups. Coach Brad Underwood believed those missed opportunities were one of many letdowns in defeat. “I felt like the shots we got were good ones,” Underwood said. "It is something we are talking about and addressing. When we do it, we are really good and it stresses our offense. I felt like the shots we got were good ones." Despite the win, Ohio State turned the ball over 19 times, which kept Illinois in the game with 26 points off turnovers. Buckeyes coach Chris Holtmann knows it could be a long season if the turnover woes do not improve with 90 percent of the Big Ten conference slate to play. “They are really good in forcing turnovers. Illinois sped us up and we made poor decisions and fortunately, we were able to weather it,”Holtmann said.